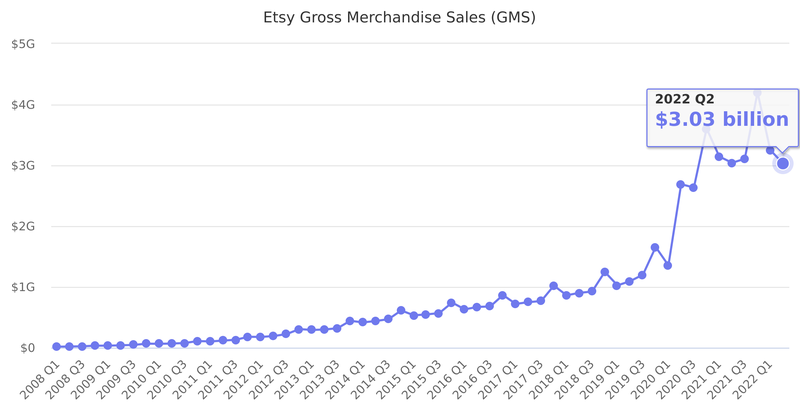 Gross merchandise sales, or GMS, is the dollar value of items sold in Etsy marketplace within the applicable period, excluding shipping fees and net of refunds associated with cancelled transactions. Gross merchandise sales (“GMS”) is the dollar value of items sold in our markets within the applicable period, excluding shipping fees and net of refunds associated with canceled transactions. GMS does not represent revenue earned by Etsy. GMS is largely driven by transactions in our Markets and is not directly impacted by Seller Services activity. However, because our revenue and cost of revenue depend significantly on the dollar value of items sold in our markets, we believe that GMS is an indicator of the success of Etsy sellers, the satisfaction of Etsy buyers, the health of our ecosystem and the scale and growth of our business. Last reported quarter 2018 Q3 it was $922.51 million, up by 20% year-over-year from $766.35 million. From $2,841.98 million in 2016 it increased by 14% to $3,252.87 million in 2017.